The cylinders arrived at Bridgnorth just before Christmas. 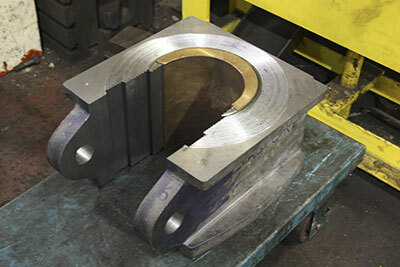 We have prepared gaskets and blank plates to seal all the orifices in order to conduct a pressure test with water to confirm the soundness of the castings. An initial test on one of the castings has taken place and further tests will follow. 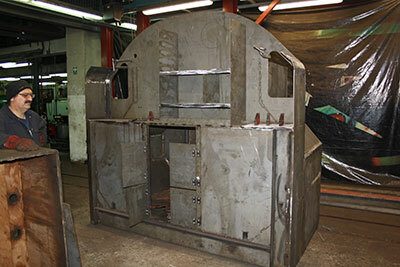 Steel cut and shaped for the ashpan has arrived and fabrication of this item will take place as time and space allows. Machining work as mentioned in the December notes continues. 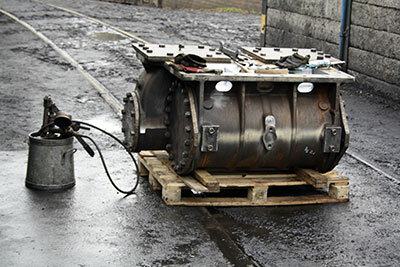 Following the casting of the pony truck wheels, The Boro’ Foundry are carrying out the initial machining prior to the wheels moving to South Devon Railway Engineering for fitting of axles and tyres. 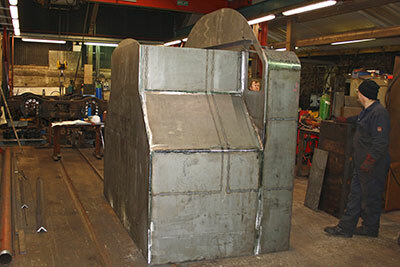 The Ffestiniog Railway’s Boston Lodge Works have been awarded the contract to manufacture the two water tanks. We are very grateful for some generous sponsorship of these items. It is not anticipated that construction will necessarily start immediately but rather when Boston Lodge can fit the work into their busy schedule in the coming months without too much disruption. There has been a good response to the appeal leaflet in Issue 436 of Steam Railway. This is to be followed up by a further appeal in the March issue of Steam Days, which will feature an article written by Trust member Alan Clothier about his career in the Swindon Design Office in the early years of BR, when he worked on a number of design details of the 82XXX tanks. It is a fascinating read, presenting an insider’s viewpoint on the genesis of the class. You will know that we recently commissioned a poster in the traditional railway poster style from Stockport artist Stephen Millership. Details can be seen in the December News. The very striking image has started to attract a good deal of attention, and the poster is available from Barbara for sale and now added to the sales page. It will also, we hope, be displayed at SVR stations up and down the line. To this end, Chris visited SVR Marketing Officer Clare Gibbard with Stephen Millership during January, and will be making contact with the various station masters to ask if they will put up a poster and help us raise the profile of 82045 with visitors to the Railway. Further plans for publicity during 2015 are in the pipeline, and these will be outlined in future updates. This is closely bound up with Publicity, and I am delighted to tell you that the 82045 Boiler Appeal is now close to £150,000, with the aim of reaching £200,000 by the year end. 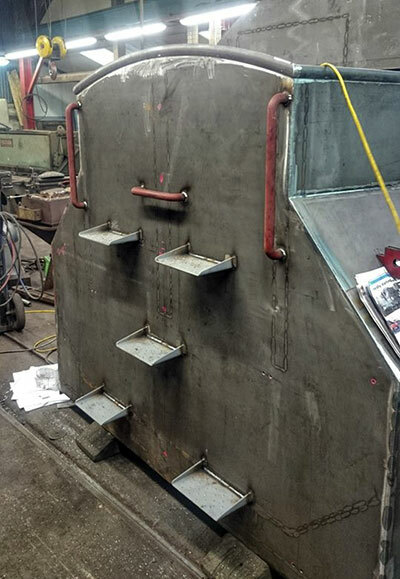 With the front tube plate sponsored, thoughts are already turning to having the boiler barrel constructed and Tony will report on this as soon as he has more concrete details. The money we have raised to date is sufficient to make considerable inroads into the boiler job, but we have no grounds to be complacent and will continue to go all-out to bring in the necessary funding. At the same time, it is necessary to make careful provision for other areas of expenditure, at the moment focused on the pony truck assemblies. I can’t say too often how fortunate the Trust is to have assembled such an excellent team of talented volunteers. 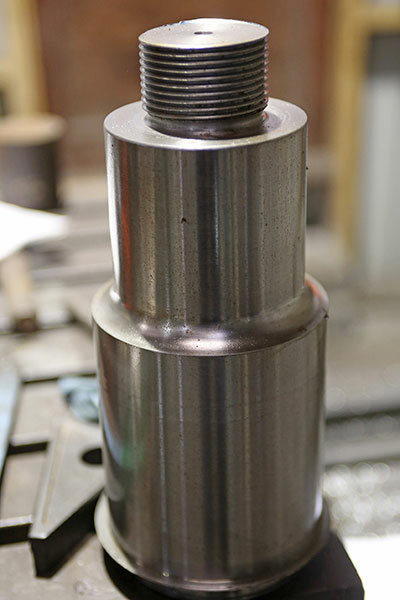 As an instance, the highly skilled and hugely time-consuming job of machining and putting together the axle box assemblies is being undertaken by our chaps, saving us tens of thousands of pounds which can now be deployed elsewhere in the build, and this has been the pattern over the past few years. The Eardington Explorer - Sold Out! Seats on Bryan Clarke’s special train on Friday 17th April have sold out in double quick time, proving him correct in his hunch that the unusual format of the day would attract attention. We estimate that the event could raise up to £3,000 for the boiler appeal, and thanks are due to Bryan and his small team of Steve Downs, John Gupwell and Gareth Price, backed up by Chris, for all their hard work in organising it. Further events are a possibility for the future, so watch this space. As Tony reports, we received a cheque for £22,000 in late December in respect of the loco’s side tanks - what a Christmas present! The member concerned wishes to remain anonymous, but he knows who he is and we would like to express our heartfelt thanks to him. The Gift Aid which this sum attracts will go a long way towards paying for the cab, too, so 82045’s superstructure is now accounted for and by the late summer the loco should really be starting to look good, cylinders and coupled wheels in situ as well. 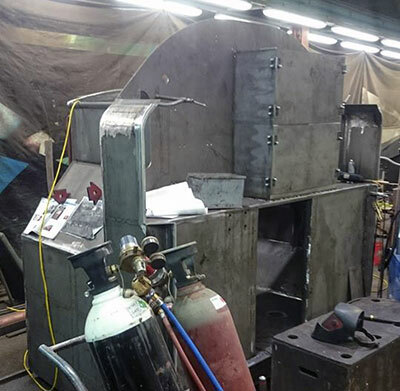 With the success of the boiler appeal and plans being finalised for the boiler barrel, the time is right to think about having the smokebox assembly made and fitted, too. We now have some approximate costings for the assembly and we know that the wrapper (the main part of the smokebox) will cost about £6,000; the door ring (rivetted inside the front of the smokebox and to which the door assembly is hinged) about £2,000; and the outer door itself about £1,000. If anyone would like to sponsor all, or part, of this most visible component of the locomotive, please get in touch with Chris. We do have the chimney ex-Class 3 mogul 77014, but it has been decided that this is beyond repair and so enquiries are under way about having the pattern made for a new one. In the meantime, we can give the old chimney a fresh coat of paint and mount it cosmetically on the smokebox, so the loco should look quite impressive. Once we have costings for the new item, this will also be offered for sponsorship. Again, if you want to reserve this - either the pattern or casting/machining - please have a word with Chris. As the brilliant CME of the Great Central Railway, J.G.Robinson, once remarked: “The chimney to a locomotive should be as the hat to a gentleman: the finishing touch.” With that lovely image I leave you for this month! 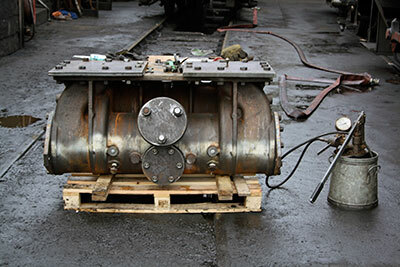 One of the cylinders with the studs fitted for end covers. One of the cylinders prepared for a pressure test. Two views of the bunker in Boston Lodge Works in mid December. Further progress at Boston Lodge photgraphed 26th January. Photos: Andy Christie. 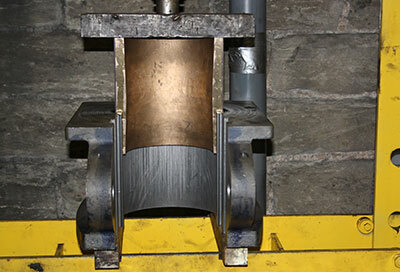 Brass crown bearing being pressed into axlebox. 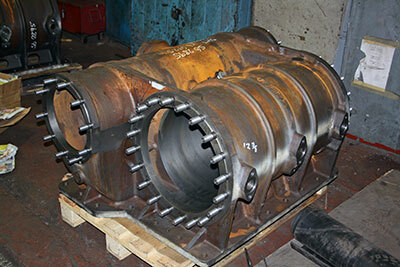 The crown bearing fully pressed into axlebox, photographed early January.